The 35th Infantry Regiment Association salutes our fallen brother, 1LT Lawrence Gregory Thode, who died in the service of his country on April 8th, 1970 in Binh Dinh Province, Vietnam. The cause of death was listed as Multi-Frag. At the time of his death Lawrence was 31 years of age. He was from Seattle, Washington. Lawrence is honored on the Vietnam Veterans Memorial at Panel 12W, Line 109. The decorations earned by 1LT Lawrence Gregory Thode include: the Combat Infantryman Badge, the Parachute Badge, the Silver Star, the Bronze Star with V, the Purple Heart, the Air Medal, the National Defense Service Medal, the Vietnam Service Medal, the Vietnam Campaign Medal and the Vietnam Cross of Gallantry with Palm Unit Citation. For gallantry in action while engaged in military operations against an armed hostile force in the Republic of Vietnam. 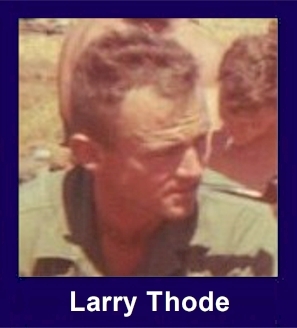 First Lieutenant Thode distinguished himself while serving as a Platoon Leader with E, 2/35th Infantry. On April 8 1970, Company E ambushed an enemy force, inflicting several casualties. As the hostile element tried to flee, First Lieutenant Thode courageously led his men in pursuit, forcing the enemy to halt and make a stand. With complete disregard for his personally safety, First Lieutenant Thode remained in the heart of the battle area to effectively deploy his men and provide professional leadership. While assisting in the calling in or artillery and gunship support, he was mortally wounded by an enemy mortar round. First Lieutenant Thode's personal bravery, outstanding leadership, and exemplary devotion to duty are in keeping with the highest traditions of the military service and reflect great upon himself, his unit, and the United States Army.